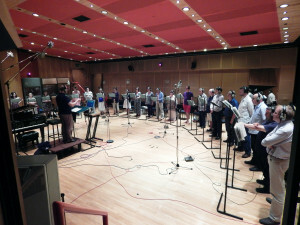 On 4 July 2015, Excelsis chamber choir travelled to the Angel Studios in London to put the finishing touches on the live recording of Sir Karl Jenkins’ The Healer – a Cantata for St Luke. Under the baton of Director of Music Robert Lewis, with Sir Karl listening from the sound booth, Excelsis spent the day singing through the work, which was commissioned by Grayshott Concerts to celebrate its 10th anniversary and first performed at St Luke’s church in the village. The recording will be released by Warner Classics on 25 September as part of Voices, an 8-CD box set of Sir Karl’s best-selling works. To mark the release of the CD, Excelsis is joining forces with another acclaimed local group, The Waverley Ensemble, to perform a concert of classical music old and new at St Alban’s Church, Hindhead, on Saturday, 10 October, at 7.30 p.m. The concert, titled Dixit Dominus, will feature Handel’s choral masterpiece as well as local composer Clive Osgood’s contemporary version of the same title. Excelsis Music Director Robert Lewis will conduct the chamber choir and orchestra, with a diverse programme that also includes Vivaldi’s Autumn from The Four Seasons, featuring local violin star Oliver Nelson, and Nulla in Mundo Pax performed by young vocalist Molly Beere. Tickets for Dixit Dominus are £15 (£8 for children under 16) and are available on the door or in advance from the Excelsis Ticket Hotline: 07805 515370; email: tickets@excelsis-choir.co.uk; web sites: www.excelsis-choir.co.uk or www.ishanibhoola.com. Doors open at 7 p.m.; St Alban’s Church, Tilford Road, Hindhead GU26 6RB. This entry was posted in In The Press on September 22, 2015 by Barbie McSean.